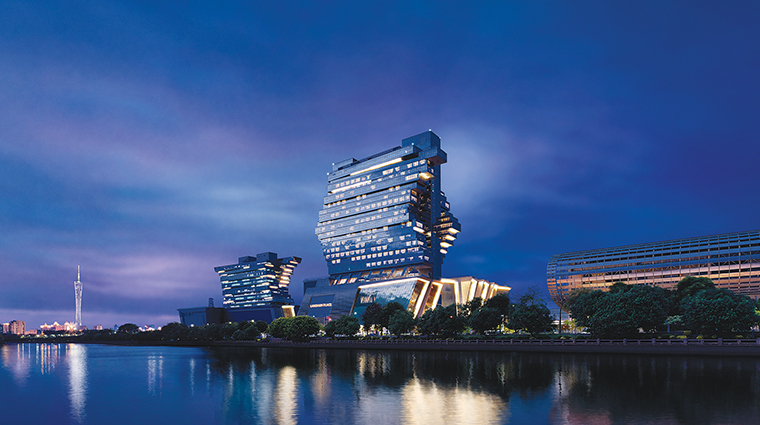 Visitors of all kinds — from those exploring Guangzhou’s cultural gems to business types attending the world-famous Canton Fair — will be impressed by the architecture of Langham Place, Guangzhou. Designed by Andrew Bromberg of Aedas International Architecture Firm, the exterior appearance of haphazard-looking stacked blocks conjures up the image of a giant children’s game. 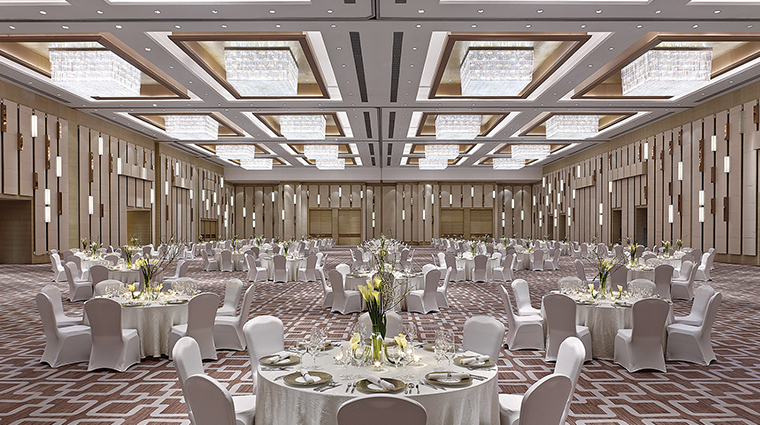 At more than 900,000 square feet and 500 rooms, the hotel is vast and downright imperial, looming over visitors both inside and out. The interiors are sleek and polished, with a gleaming marble lobby and a large open area in the center that extends 22 stories up to a gorgeous atrium that lets in loads natural light. 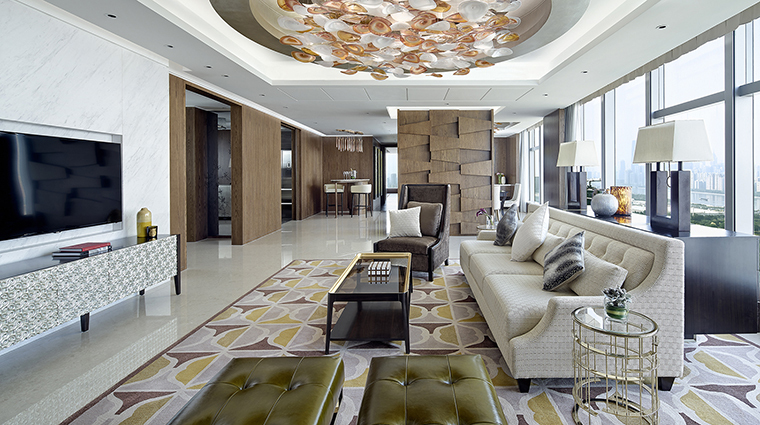 Expect an exceptional experience at the five dining venues and the private club level lounge. A fitness center, pool, mini golf and Langham signature Chuan Spa round out the luxury offerings. 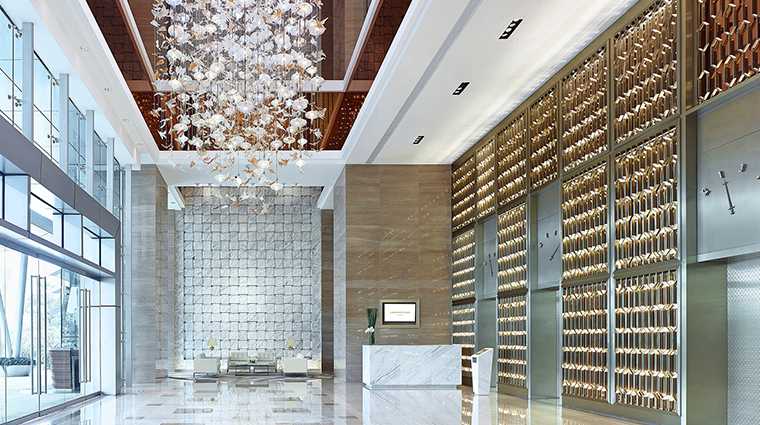 Whereas most hotels have silent, enclosed hallways, Langham Place is open and airy, with views that look down dizzyingly onto the elaborate sand and stone art in the lobby below. The Langham luxury brand’s signature Chuan spa follows the principles of traditional Chinese medicine and feature holistic, healing treatments. Also located on the fourth floor, the indoor heated pool has a glass roof and a deck filled with pool loungers. Of the five restaurants within the luxury hotel, Ming Court is the one you won’t want to skip (especially if you’ve never dined at its famous Hong Kong location). 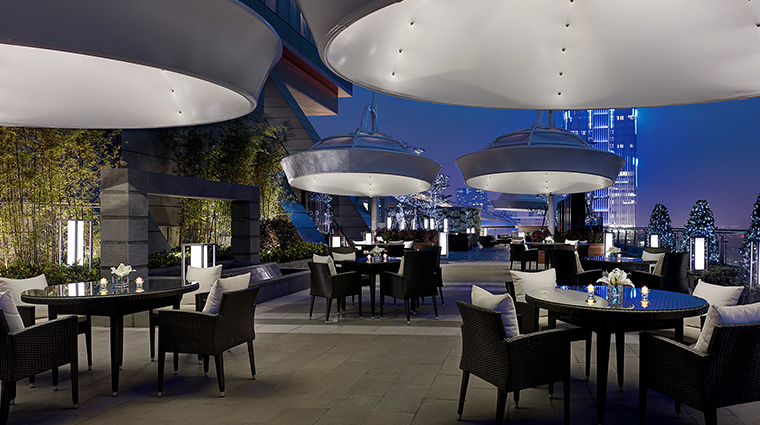 Surrounded by the glittering cityscape, Sky Bar is an open-air oasis. 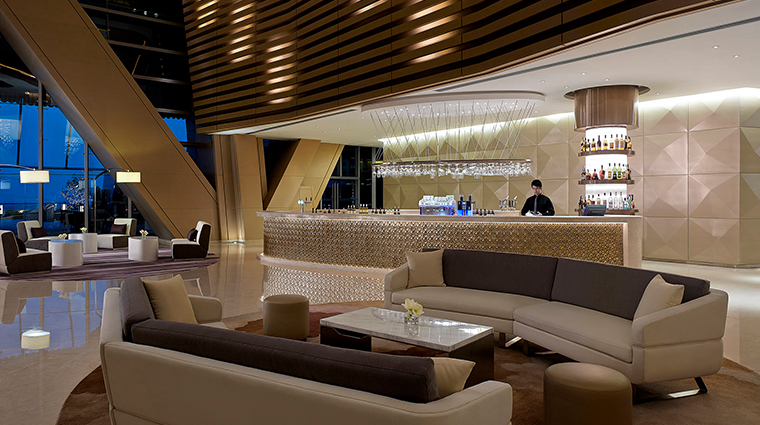 Unwind with an array of signature cocktails and vintages as you watch the sunset or party under the stars. For an extra dose of relaxation, hit up the herbal steam rooms, saunas and the Jacuzzi after your spa treatment. The Guangzhou hotel’s health club has all the cardio and weights you need to get in your workout. Order the tea while dining at Ming Court — it will be poured according to ancient Chinese tea ceremony practices. 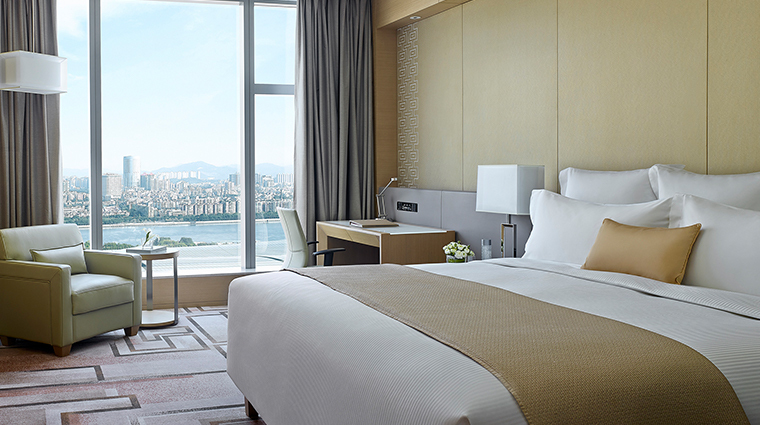 Every room’s door looks out over the central atrium, which offers an amazing experience of the grandeur of the Guangzhou hotel. Each room is contemporary and tasteful — subtle luxury reigns here with plush carpeting, light neutral tones, floor-to-ceiling windows and gorgeous marble bathrooms with deep tubs to sink into after a long day. The plush king bed dominates the space, rightfully so, with a pillow menu to ensure a good night’s rest. The views are picturesque, too, and vary from room to room. Some are of the Pearl River with local fishing boats lazily passing by, some are of the bold Guangzhou skyline and others are of the Canton Fair Complex. 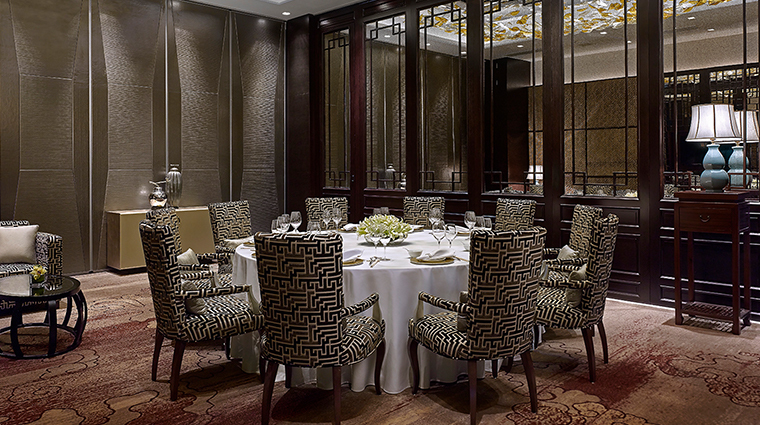 The fare at Ming Court is traditional but elevated Chinese, which is served in a stunning room that oozes Oriental glamour. The Open Kitchen is open (fittingly) morning through night and offers a top buffet experience, including Japanese robatayaki with several stations dedicated to preparing fresh seafood with various Japanese cooking methods. The hotel breakfast offers hundreds of options, such as custom-made omelets, fresh waffles, Chinese porridge, chocolate doughnuts, house-made yogurt and more. 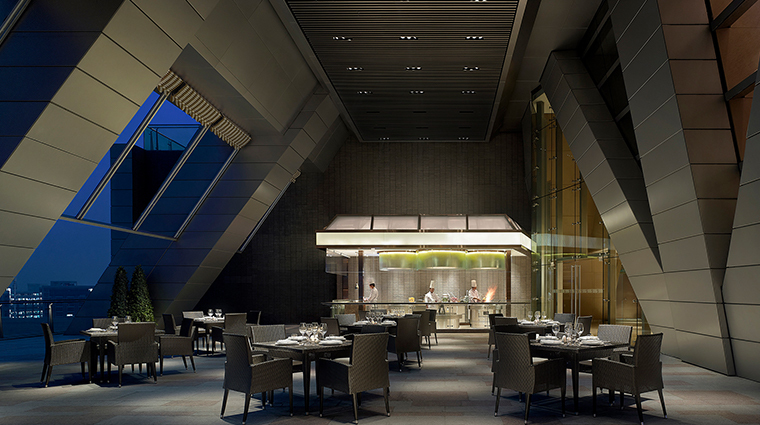 Alfresco has an open-grill concept (you can see the chefs cooking your choice of meat or seafood) within a dramatic space with soaring slanted windows that look out over the twinkling lights of the city.